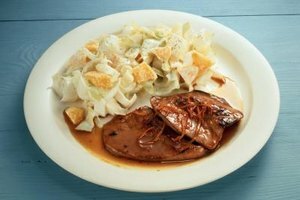 Serve venison liver with noodles or mashed potatoes. 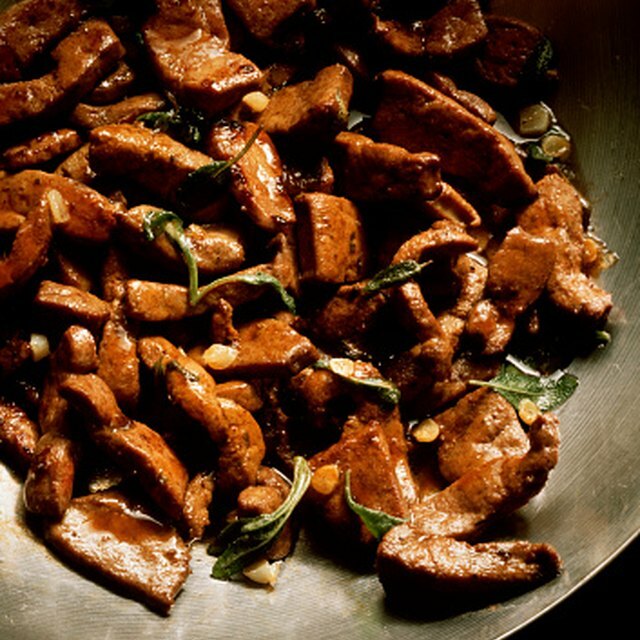 Liver from a young deer, elk or antelope is rich in flavor and nutrients, and cooks up nicely in a hot frying pan. Because the liver absorbs and stores unwanted substances found in the animal's diet, the liver of older animals is less tender and tends to have a strong odor and flavor. Look for liver with a bright color and a fresh aroma, and give the meat a buttermilk soak to temper those gamey flavors. Blast the liver for a few minutes in a hot skillet, and toss in additional ingredients to suit your preferences. Trim any excess fat, then cut the liver into 1/4-inch slices. Place the liver in a bowl and soak the slices in milk or buttermilk for 30 to 60 minutes. You can also soak the liver in salt water or a bowl of water with about a teaspoon of white vinegar. Any of these methods will help to tenderize the meat and remove the gamey flavor. Rinse the liver thoroughly, then pat it dry with paper towels. Place a small amount of flour on a plate, then season the flour with salt and pepper. Dredge the liver in the seasoned flour so both sides are lightly coated. Cover the bottom of a cast-iron skillet or Dutch oven with cooking oil, butter or bacon fat. Heat the oil over medium-high until it shimmers. Add bacon strips and a sliced onion for extra flavor and variety, if desired. Add the bacon and onion to the hot oil and saute until the bacon is slightly crisp and the onions are golden brown. You can also saute sliced mushrooms. Transfer the bacon and onions to a saucepan, then keep them warm on a burner set on low while you fry the liver. Add more oil to the skillet, if needed. Heat the oil, then fry the liver for 1 to 1 1/2 minutes on each side. Transfer the liver to a serving plate. Cover the liver with the onions and mushrooms, then serve hot. Cook sliced liver in small batches. Too many slices may cause the temperature of the oil to drop, resulting in soggy, tough meat. Make gravy from the pan drippings, if desired. Add a small amount of flour to the pan, and stir until the flour melts smoothly into the fat. Add water or beef broth slowly, then stir until the gravy thickens.